MIDWEEK DINING IN GLASGOW JUST GOT EXCITING! Let’s face it; midweek dining doesn’t need to be boring or break the bank. That’s why we’ve created our market menu to see you through from Sunday to Wednesday. 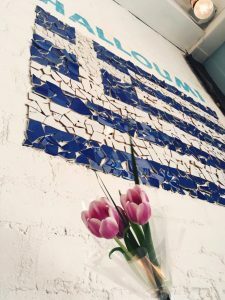 If you’re in Glasgow, it is terrific value and packed full of the Greek dishes that know and love us for. Next time you visit, make sure you choose any three mezze from our market menu for only £14.99 per person. 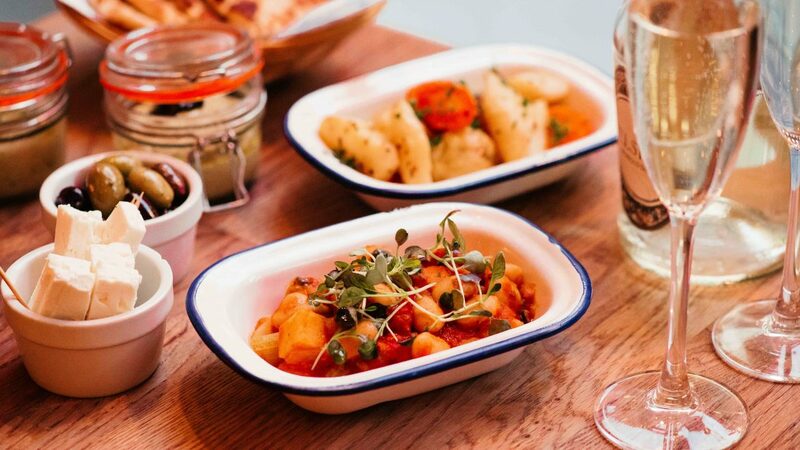 It’s the perfect way to dip your toes into our Mediterranean cuisine and catch up with friends in Glasgow city centre over the best Greek in town. Available from 12 until 10 pm, every Sunday to Wednesday. To book, call our Halloumi restaurant on 0141 204 1616 or book online. 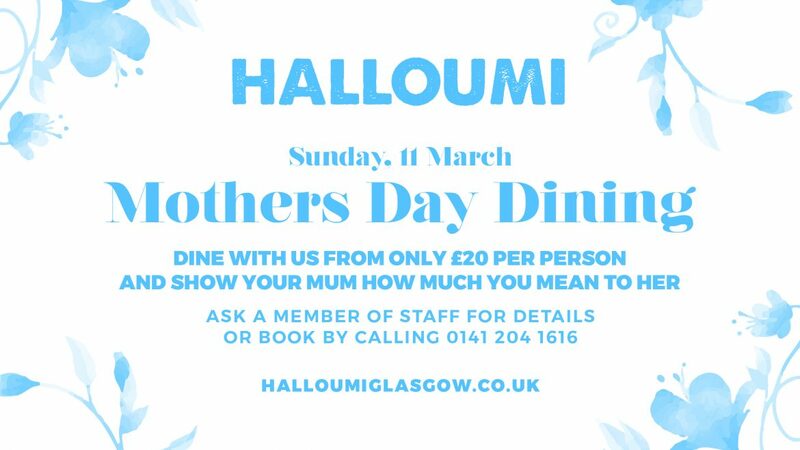 Treat your mum to our beautiful Mother’s Day menu in Halloumi and show her how much you care. From our favourite dishes to our seasonal spring delights, your mum will feel extra special when you dine with us. 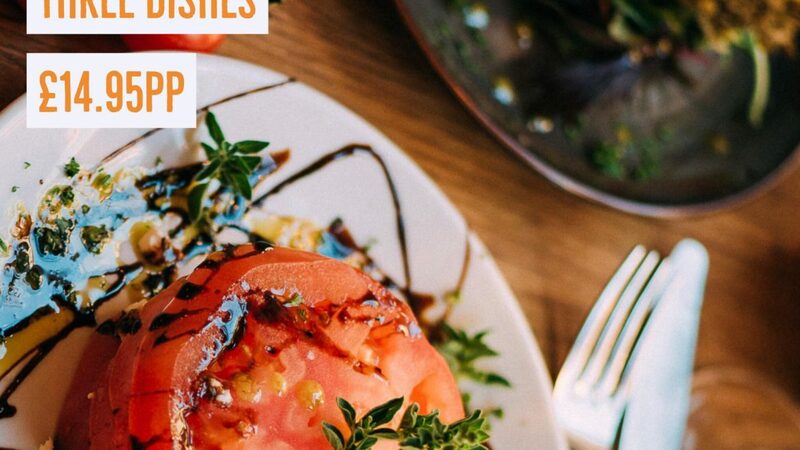 Let her choose from new favourites like our crumbly goat’s cheese tart with red onion chutney and balsamic vinegar and a tender swordfish steak with cherry tomatoes and speciality extra virgin oil from Greece. Or indulge in classics like our perfectly grilled halloumi with pomegranate and moussaka. Mmmmm, thanks, mum! Last year we treated all your beautiful leading women to a lovely trio of tulips 🌷 for Mother’s Day and this year we’re going to do the same as it was so good seeing how much it meant to you all! Book now and join us for a memorable Mother’s Day. We’ll be taking our final flower order on Friday (9th), so please make sure you call us on 0141 204 1616 to reserve your table and avoid disappointment. All you need is love ❤️️ … and Halloumi! Looking to celebrate Valentine’s Day in Glasgow? Whether you’re a mid-week romantic or weekend lover, we will be serving a specially-crafted Valentines sharing menu from Monday 12th February until Sunday 18th February in our restaurant on Hope Street. We’ll also be playing cupid and will be gifting a rose to each table that visits. So, whether you’re planning a romantic date or a catch up with friends, join us and feast on our tasty Meditteranean mezze this Valentine’s Day. What’s On The Valentine’s Menu? Starting with Greek olives and feta, your choice of dip and hot pitta, it’ll be love at first bite. Moving on to your choice of five special sharing dishes, including crab, swordfish steak and french cut roasted chicken breast alongside all our popular favourites, you’ll be spoilt for choice. All for ONLY £49.95 per couple include a beautiful rose 🌹, make sure to book to avoid disappointment. It’s January, the weather is miserable but our express lunch is back and looking prettier than ever! Join us any weekday for a taste of the Mediterranean that won’t break the bank. 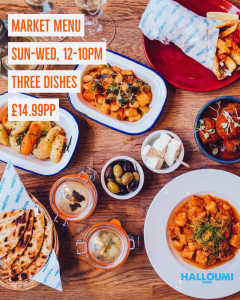 With three of our magical mezze for ONLY £9.95, including your favourite slow-cooked marinated lamb or chicken gyros, our rich homemade meatballs (keftedes), you really don’t want to miss it. Perfect if you’re looking to catch up with friends in Glasgow city centre. It’s available from 12 noon until 2:30 pm, Monday to Friday. For those of you not participating in Dry January, our winter bubbles will delight. For only £20pp, feast over your choice of five mezze whilst our team pours you a bottle of fizz. Now that’s how to January! Available Wednesday to Friday from 12 noon until 10 pm. December dining has never looked so good… If you’ve not tried our festive menu and winter warming drinks yet, you need to take a break from shopping and stop by! Available throughout December, round up your family and friends and join us a lazy lunch or enjoy our brilliant value festive menu. There’s something for everyone to enjoy. 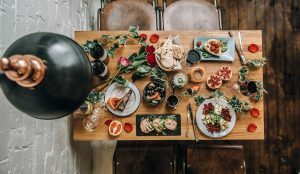 From our Galopula – the most succulent oven-roasted turkey in a red wine jus with pigs in blankets and stuffing on the side to ultimate boozy drinks, it’s the time to celebrate and indulge! Don’t forget, if you looking for gift inspiration, our gift vouchers make for the perfect present and can be purchased online from the comfort of your home and sent instantly with a personalised message by text or email. You can even print them yourself. 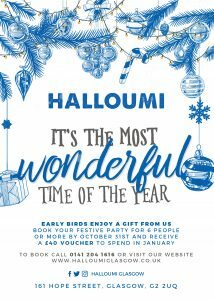 Our gift vouchers are now so easy to buy, pop on over to halloumiglasgow.co.uk/gift to personalise your voucher and choose to send via text, email or via 1st class post. Or if you’re passing by our restaurant on Hope Street, you can buy directly. Give them some Greek for Christmas and watch their faces light up! Baby, it’s cold outside. But… it’s warm in Halloumi! Come on in and get cozy with three heartwarming and delicious mezze for just £9.95 between 12 and 2:30pm, Monday to Friday. 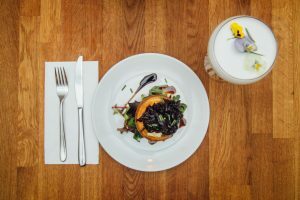 Looking for the best lunch menu this side of the Clyde in Glasgow city centre? Then you’ve found us! Our menu is bursting with fresh flavours from the Mediterrarean and our lunch menu will steal your foodie-loving heart. From our chicken souvlaki – perfectly cooked chicken thigh skewers to the classic lamb dolmades or even the ultimate handheld flatbread of joy – our gyros; we have something for everyone on the menu to enjoy. Halloumi Holidays are coming! 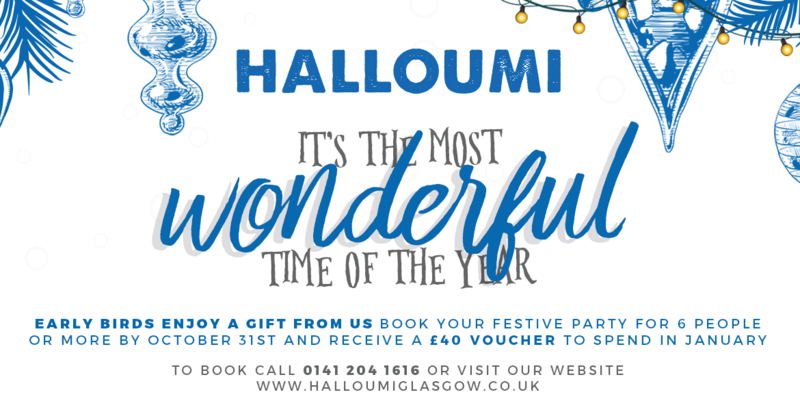 Yes, we’re talking Christmas in September but as a gift for you early birds who organise the best Christmas parties in Glasgow, we will treat you to a £40 gift voucher if you book your Christmas party for six or more people by mid-October at Halloumi. How’s that for an early Christmas treat? With a two-course lunch £19.95 and a three course dinner at £24.96, how can you resist? All your favourite Greek dishes are on there like our classic moussaka – layers of aubergine and courgette with lamb, pan fried Scottish scallops, and our famous beef stifado – a rich stew of Scotch beef and shallots. Gorgeous eating when the nights get a bit colder. To book, phone Lapreet on 0141 204 1616 by mid October and we’ll treat you to a £40 voucher to spend in Halloumi this January. 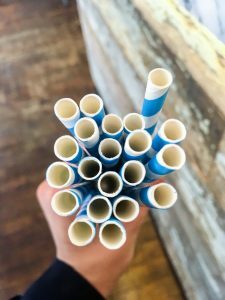 If you’ve joined us in Halloumi this summer you might have noticed that we’ve stopped putting plastic straws in your drinks. This is a small change to help reduce our plastic in the restaurant. 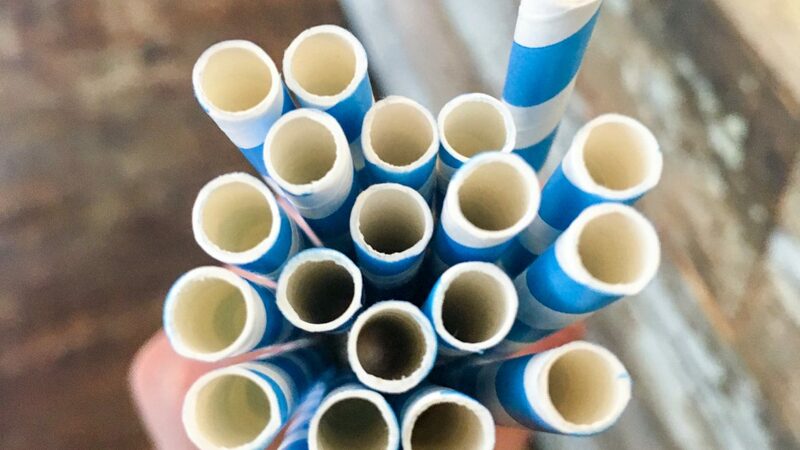 If you would like a straw in your drink, simply ask your straw and we’ll give you one of these Santorini blue and whitewash paper beauties – how cool are they? 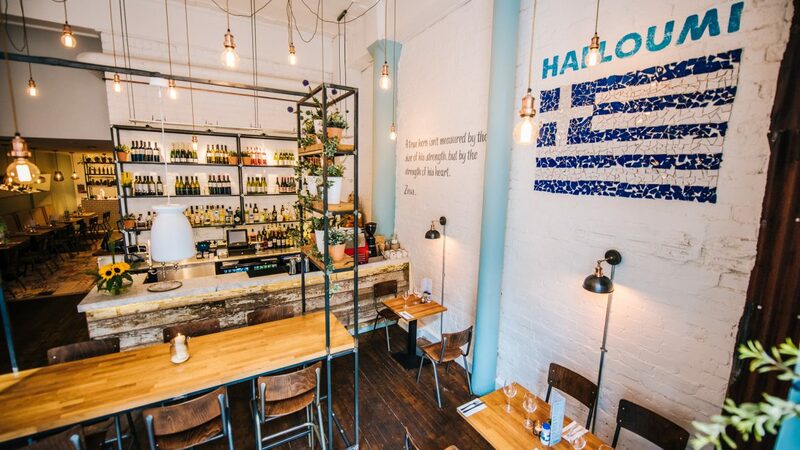 We are beyond excited to share that Halloumi, has been shortlisted for the coveted title of best restaurant in the UK’s biggest industry awards. Specialising in Modern Greek cuisine we are the only Scottish finalist in the standalone UK restaurant category against seven finalists including Uli in Notting Hill and Tom’s Kitchens led by founded by award-winning chef Tom Aikens in Birmingham. Recognising inspirational and creative spaces, Zaza Hadid – the international architect who reimagined the spectacular wave and structure of the Riverside Museum, was a previous judge. Restaurateur Michael Caine and Christopher Cowdray of the Dorchester Collection feature on this year’s judging panel who will scrutinise the creative concept and delivery of each restaurant design.